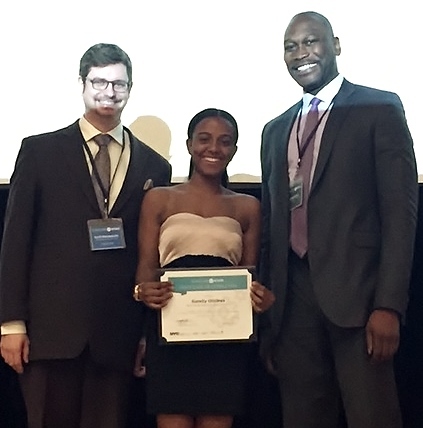 It was another banner year for Scholars At Work (SAW), a citywide program that pairs high school and college students with transportation and manufacturing businesses for competitive 13-week paid internships. SAW Graduate Sunelly Oliveras, center, with Scott Mendelsohn, Senior Director, NYC Department of Education, and Gregg Bishop, Commissioner, NYC Department of Small Business Services. This year, 111 graduates from 14 Career and Technical Education (CTE) schools were placed with 58 businesses across the city’s five boroughs. Of the businesses, 28 offered students employment after graduation. In their internships, students completed such tasks as assembly work, automotive repair, customer service, data entry, inventory management, painting, and welding. Many students leave the internship with an offer of employment and are able to take a supervisory role with the next year’s incoming crop of interns. The class of 2016 – 85% male and 15% female – was the program’s largest since its inception in 2009. In comparison, 103 high school students recruited from 16 CTE schools completed internships at 51 companies in 2015. The program to date has connected more than 1,200 students to internships that give them an unmatched advantage in the job market – experience in a professional work environment, a new skill set, and an opportunity to develop a resume, sharpen their interviewing skills and hone their soft skills in a work readiness workshop. SAW is funded by the New York City Department of Small Business Services and the Department of Education, in collaboration with Grant Associates, which coordinates the program through the NYC SBS Industrial and Transportation Career Center the company operates in Jamaica, Queens. Sunelly Olivares, who interned with Plexicraft in the Bronx in the company’s production unit, gave the farewell speech to the graduates and honored guests. “The fact that we are all here supports the idea that youth want to succeed,” she said. Sunelly implored her fellow graduates to think of themselves as surgeons with the same capacity for being determined, resilient in the face of a challenge, disciplined, and for having the willingness to constantly grow in their profession.